Methimazole treats hyperthyroidism in cats, a condition in which too much thyroid hormone is produced. It will not cure the disease, but will usually control it if given for the rest of the cat's life. Methimazole may also be used to protect the kidneys in dogs receiving cisplatin, an anti-cancer drug. Methimazole reduces the amount of thyroid hormone produced by the thyroid gland. 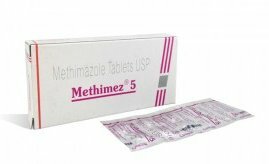 Methimazole tablets are given by mouth. The tablet form is very bitter, and it may be difficult to administer. Use a "pill pocket" treat or hide it in your pet's favorite treat. Always follow the dosage instructions provided by your veterinarian. If you have difficulty giving the medication, contact your veterinarian. In most cases methimazole will lower the level of thyroid hormone in hyperthyroid cats. It will generally take 1-3 weeks before the level of thyroid hormone produced by the body will start to decrease. Methimazole will not cure the disease, but will usually control it if given for the rest of the cat's life. What should I discuss with my veterinarian while considering Methimazole? Talk to your veterinarian about what tests and exams may be necessary while your pet is taking Methimazole. Also, discuss what type of outcome is expected. Have your veterinarian explain the other treatment options for hyperthyroidism in cats. Tell your veterinarian if your pet has a blood disease, liver disease, or autoimmune disease; or may be pregnant, is nursing, or if you intend to breed your pet. Methimazole will not cure the disease, but will usually control it if given for the rest of the cat's life. Follow your veterinarian's dosage instructions carefully. Side effects are most common during the first 3 months of treatment. Methimazole has a very bitter taste. Not for use in pets who are hypersensitive (allergic) to it. Use with extreme caution in pets with anemia, clotting disorders, bleeding, low white cell and platelet counts, or diseases of the immune system, liver, or kidney. Use with extreme caution in pregnant or lactating animals (females nursing their young). If the mother is receiving Methimazole, place the young on milk replacer after they have received the colostrum (first milk immediately after birth). In addition to monitoring of thyroid hormone levels, laboratory tests to check liver and kidney function and blood cell counts may be performed before starting treatment and then regularly thereafter. Side effects tend to occur in the first three months of treatment. If you observe any of the effects listed below, contact your veterinarian immediately. May see loss of appetite, vomiting, or lethargy. These usually occur within the first two weeks of treatment and may stop even with continuation of treatment. Less common side effects include liver problems resulting in the above signs plus yellowing of the gums, skin, or eyes; itching of the face, resulting in scratching; or bleeding tendencies. Your veterinarian will determine if these effects necessitate stopping the medication and treating with surgery or radioactive iodine therapy. Rarely, you may see the development of myasthenia gravis, a neuromuscular disease that severely weakens muscles and may cause difficulty swallowing. If your pet is unusually tired, has a fever (temperature over 103°F), or shows signs of bruising or bleeding, contact your veterinarian immediately. If your pet experiences an allergic reaction to the medication, signs may include facial swelling, hives, scratching, and sudden onset of diarrhea, vomiting, shock, seizures, pale gums, cold limbs, or coma. If you observe any of these signs, contact your veterinarian immediately. Store tablets at room temperature in a tightly closed container protected from light. Refrigerate oral suspension. Keep away from children and pets. If you know or suspect your pet has had an overdose, contact your veterinarian immediately. Signs of an overdose are similar to the common side effects listed above. What should I avoid when giving my pet Methimazole? Consult your veterinarian before using Methimazole with any other medications, including vitamins and supplements, since interactions may occur. The drugs clomipramine, amitriptylline, omeprazole, and cyclophosamide may interact with Methimazole and cause severe side effects.